The conference is being organized by a group of medical students at the University of Ottawa, in collaboration with other faculties and programs. Students and professionals from various disciplines will be attending the conference. Examples include, but are not limited to: medicine, nursing, physiotherapy, psychology, business, law, arts and humanities, social sciences. The advocacy areas that the conference is focusing on are Education and Interprofessional Collaboration. Moving forward, the conference will be an annual event at the University of Ottawa. The organizers of the conference are motivated by the desire to find an innovative way to foster interprofessional collaboration, with the aim of finding ways to work together to improve patient care in Ontario. The project has been well received by the Faculty of Medicine at the University of Ottawa. Planning is well under way, and we look forward to welcoming attendees in the coming year. The Ontario Health Coalition (OHC) is an organization that serves to protect and improve the public healthcare system in Ontario through education, public policy debate and collaborations with grassroots organizations throughout the province. The OHC has played a big part in pushing back against the province efforts to slash hospital funding and close community hospitals. In addition, the OHC has cooperated with Canadian Doctors for Medicare in defending Medicare and advocating for the expansion of Medicare to all areas of health (e.g. dental care, optometry, Pharmacare, etc.). Locally, the London chapter (London Health Coalition) has seen several Schulich Student play active roles as participants, speakers and organizers of advocacy initiatives focused on healthcare funding cuts. Last April, the branch participated in a province wide rally in protest of the loss of healthcare workers and funding over the past nine consecutive years of cuts. More recently, the branch launched a Care Bear Tour involving a giant teddy bear and the message, "We can't bear to lose Medicare." The goal of the initiative was to spread awareness of the Charter Challenge occurring in British Columbia which could potentially impact laws that serve to protect patients against extra billing and user fees by private clinics. The central theme of the project was that care must remain the centre of our public healthcare system, not profits. Provincially, the OHC is an excellent example of how local groups can coalesce and collaborate in order to present a collective voice that is louder than the sum of its parts. As medical students aiming to advocate for our future patients, we can look to this organization for guidance in our own projects as well as a framework within which we can direct these initiatives. Given the uncertain climate regarding provincial healthcare spending that we currently find ourselves in, the local branches of the OHC will likely remain a focal point for advocacy efforts to uphold the principles of fairness and equity in the Canadian healthcare system. If you have any questions, please contact Schulich students Trystan Nault (tnault@uwo.ca) or Gunjan Mhapankar (gmhapank@uwo.ca). In May 2016, a small group of medical students from across Canada became concerned about a growing number of physicians who were charging their patients fees for medically necessary care. The practice, known as "extra-billing", was in violation of the Canada Health Act guidelines, but the guidelines were not being enforced by the federal government. The students organized a campaign to put pressure on federal Minister of Health Jane Philpott to more adequately enforce the Canada Health Act and put a stop to extra-billing. The group, called Defend the Act campaign, was made up of approximately 20 medical students from schools across Canada, and was organized by student leaders based at the University of Alberta and McMaster University. In addition to organizing a one-time day of action on September 29, 2016, they wrote and sent a letter to Minister Philpott which was cosigned and endorsed by Canadian Doctors for Medicare (CDM), the Canadian Federation of Medical Students (CFMS), and the nternational Federation of Medical Students' Associations - Quebec (IFMSA-Q). The group also created a website (defendtheact.com), wrote an op-ed that appeared in the Hamilton Spectator, organized an email-writing campaign, and organized a Thunderclap campaign for Twitter and Facebook (which unfortunately came short of its 100 signature goal). The group has yet to receive a response from Minister Philpott, but they are hopeful the campaign has helped shed light on the problem and put pressure on provinces such as Quebec and Saskatchewan to eliminate policies that allow doctors to charge their patients fees for medically necessary care. We believe that the campaign created a model that other student groups can use for one-time lobbying of government stakeholders. If you have any questions, please contact McMaster student Nick Parle (nick.parle@medportal.ca). This initiative is designed to reduce stigma by raising awareness about mental health, providing a sense of community and support, and facilitating dialogue between those experiencing mental illness and those who have not. It consists of two parts. The first is a peer-led discussion, where students share personal mental health experiences amongst a small group of colleagues who have had similar mental health experiences, in order to build supportive ties among one another. This serves as preparation for thesecond event, where students share mental health narratives in a large group discussion amongst their peers. An emphasis is also placed on strategies for how to engage in sensitive discussions from both the perspective of person in distress and the person providing support. This will be the second year we are holding this event. Feedback from the first year was unequivocally positive, with participants reporting that the session both raised awareness about mental health issues among medical students, and helped equip students to engage with those who had experienced mental illness. This initiative demonstrates that stigma can be reduced through safe and open disclosure, and can be adapted to learner-wellness initiatives across different medical schools. For more information feel free to contact Amanda Sauve (asauve2018@meds.uwo.ca) or Jeremy Chitpin (jchitpin2017@meds.uwo.ca). Taking inspiration from the need for more culinary and nutrition learning in medical schools, University of Ottawa’s Medical Students Promoting Nutrition group and Refugee Health Initiative partnered with Loblaws to provide culinary and nutrition training for medical students and refugee families. The three pillars of the program were to enhance nutritional learning through teaching by a registered dietitian, practical hands-on culinary training provided by Loblaws’ chefs, and promoting healthy eating in partnership with refugee families. The program had a total participation of 40 medical students and refugee families. The reception of these interactive cooking workshops has been unequivocally positive by both medical students and refugee families alike. Over the next few years, this pilot program aims to be expanded to broaden its impact and strive for continued success. Medical students at McMaster University have come together to create a Special Task Force for lobbying Hamilton's municipal government. The Task Force's objective is to advocate in favor of evidence-based healthcare and poverty-reduction strategies, including a Housing First initiative to help alleviate homelessness and a basic income guarantee (BIG). The Task Force is designed to help future physicians build essential political advocacy skills, which they can apply when advocating for their patients and for vulnerable populations in their community. We also hope to inform policymakers of promising interventions that are likely to improve the health of Canadians. Although medical students have traditionally lobbied for healthcare reforms at the provincial and national level through events like OPAC and CFMS Lobby Day, students have less frequently advocated at the municipal level. Convincing municipal governments to accept pilot initiatives for progressive social programs such as supervised injection sites (as Toronto did this past Saturday) can put evidence-based policies in the national spotlight. It may also be worthwhile to convince cities to formally state that they are in favor of provincial or national initiatives such as a National Housing Strategy; these formal statements are important tools for convincing policymakers at higher levels of government that an idea has wide-reaching support. The Task Force will be meeting with civil servants, policy experts and physician advocates to determine a strategy for municipal lobbying, and locate existing evidence summaries which can be delivered to municipal decision makers. Students from McMaster who attended federal and provincial Lobby Day will be called upon to teach new participants how to advocate effectively. The Student Health Initiatives & Education (SHINE) is a student-run group at the University of Toronto that actively aims to promote wellness among medical students through educational workshops,recognizing the potential benefits of supporting healthier future physicians. Its recent seminars have included speakers on coping with addictions in healthcare professions, a panel on balancing relationships with medicine, and nutrition workshops with registered dietitians. It has worked collaboratively with the Faculty of Medicine to facilitate discussions on mental health and promote opportunities yoga classes to mindfulness sessions. For more information on the group’s work, check out their website http://uoftshine.weebly.com/. Compass North Clinic is a new student-led healthcare initiative in Thunder Bay, led by students from Lakehead University and the Northern Ontario School of Medicine. Comprised of 20-30 learners, the Compass North Clinic includes students from medicine, nursing, social work, psychology and law, who collaborate to lead and develop health promotional programs aimed at addressing the health needs of the Thunder Bay community. The groups hopes to implement clinical services later this year. The group is also actively conducting research on the navigation of the Thunder Bay health system, in order to help support clients locate and access the services they need. Compass North has formed partnerships with local community organizations in order to hold health promotional and psycho-educational workshops for community members. NOSM’s Sudbury-based campus is also developing similar student-led clinic – more on this in NOSM’s next Advocacy Highlight. Jennifer McCall (Queen's Medicine Class of 2018) is a big proponent for Pharmacare and has been working on a number of projects to spread the word about a public drug plan for Canada that is universal, comprehensive and sustainable. In January, she wrote a letter to premier Kathleen Wynne in regards to the well-publicized meeting of provincial and territorial Ministers of Health with the Federal Minister of Health, Dr. Jane Philpott. The meeting was set January 21-23 in Vancouver to discuss a re-negotiation of the Canada Health Accord. 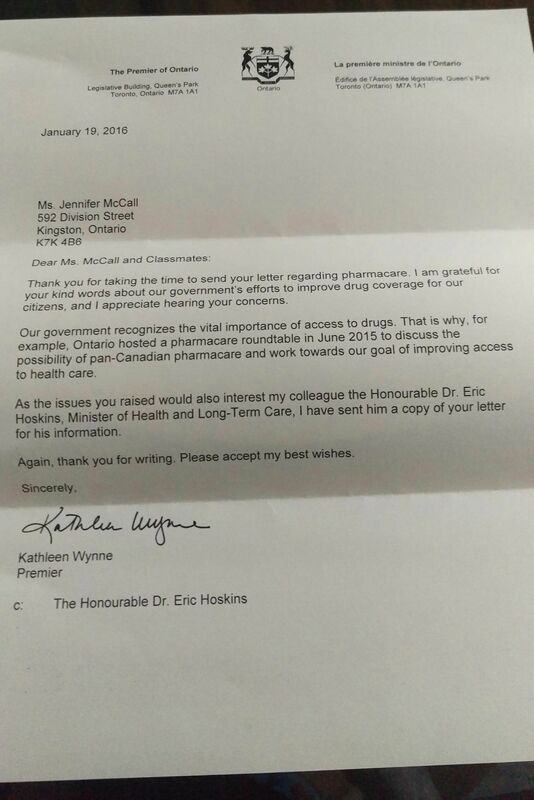 The letter was signed by students from Queen's Medicine and was responded to promptly by Kathleen Wynne. Jennifer is Co-Director of Kingston Students for Medicare, an inter-professional student branch that works on both political advocacy and community awareness projects to support Pharmacare. During the fall, Jennifer met with 3 out of 4 MP candidates to speak about their support of Pharmacare. To raise community awareness, Jennifer has written two articles in the Queen’s Medical Review about Pharmacare and is in touch with a Kingston city councillor for municipal support of the program! In support of the United Nations Agency for Refugees (UNHCR)'s Syrian refugee crisis relief efforts, a group of students at the University of Ottawa organized a fundraising and advocacy dinner. The dinner, A New Beginning, was sold-out and brought together just under 200 students and young professionals of all backgrounds - including medicine and law. Aside from raising over $2000, the dinner featured local refugee advocates and organizers, as well as a number of former refugees who shared their harrowing and inspiring stories. These stories served to inspire and motivate attendees, in the spirit of refugee advocacy. The event page can be accessed here. Should you have any questions, comments or just wanted to connect, feel free to email the organizers at ghigottawa@gmail.com. If you would like to be notified of any similar events being organized in the future, please sign up here. McMaster’s Health Advocacy for Refugees Program (HARP) is currently running an initiative to connect students at McMaster with a Hamilton NGO called Micah House. Micah House is a community organization in Hamilton that serves as a home for newly-arrived refugee claimants for 6-8 weeks, while providing them with resources to help with the transition to living in Hamilton. After connecting with the organization, students help refugee claimants adjust to locate grocery stores, navigate public transportation, and locate affordable healthcare services. The initiative is important in three ways. First, it addresses recent cuts to refugee healthcare that make it more difficult to find affordable healthcare services. It also provides students with first-hand knowledge of how difficult it can be to access healthcare services as a person new to Canada; when they eventually become physicians, this knowledge will allow them to better empathize with and assist refugees and new immigrants. Finally, it allows students the chance to break out of the “university bubble” and connect with their surrounding communities. Student interest groups at other schools can hopefully take inspiration from this initiative and find ways to connect students with organizations in their surrounding local communities. The Facebook Page for MacMed's Health Advocacy for Refugees Program (HARP) can be found here (feel free to join the group!). A description of Micah House is found here. The Students for Antimicrobial Stewardship Society (SASS) is an organization launched earlier this year at U of T dedicated to raising awareness about antimicrobial resistance and promoting responsible prescribing practices. It is starting conversations early in medical education about the negative impact of inappropriate antibiotic use, from the development of deadly antibiotic-resistant infections, to unnecessary healthcare expenses. SASS’s goal is for the message to catch on at other medical schools (and beyond) and hopes to see chapters established across the country! If you’re interested in finding more information, check them out on Facebook https://www.facebook.com/SASScanada/, Twitter @SASS_Canada, or through their website http://www.sass-canada.ca. The Ontario Medical Students Association (OMSA) is the dedicated student voice of the OMA. The organization represent the views and concerns of the over 3,000 Ontario medical students on a number of issues.